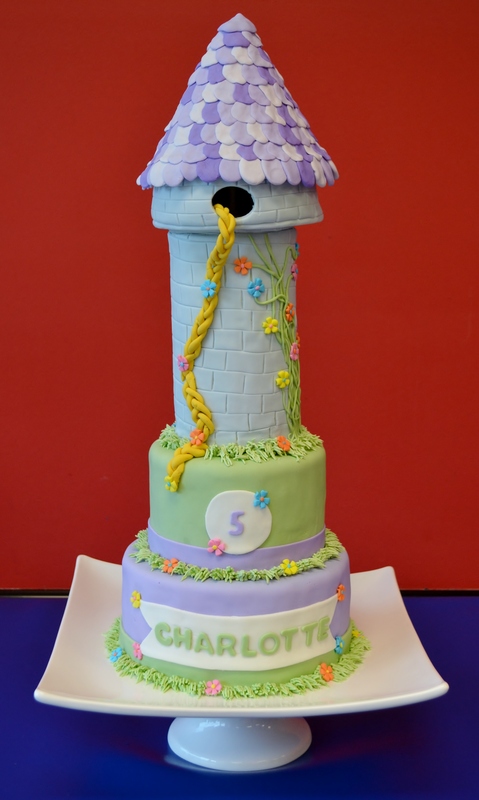 My client for this cake simply asked for a Tangled/Rapunzel themed birthday cake for her daughter’s fifth birthday. After researching what the tower from Tangled looked like, I designed the cake using purple and green as the main colors. I then constructed a tower from (4) 4-inch round cakes and added a tower top which I constructed using fondant. I finished the cake off using a golden braid, fondant vines and flowers (which I made much brighter than the base cake to allow them to “pop”), and buttercream “grass” between layers. The client put the candles on the edge of the purple layer which lit up the entire cake when the lights were turned off. The finished cake stood over two feet tall.